Ricardo and Cooper Corporation of India have further underscored their long-standing and highly successful collaboration with the launch of a new range of engines for both automotive and off-highway applications. The new in-line four and six-cylinder engines announced at Auto Expo 2012 – India’s premier international automotive event – will respectively provide power ranges of 100-125 kW and 156-200 kW and are targeted at both the Indian and international markets. In addition to powering the latest automotive products, the new engines are targeted at a wide range of off-highway and industrial applications ranging from large fork-lift trucks, to generator sets and construction equipment including earth movers. A completely new design, the engines incorporate a range of advanced technologies that make them highly fuel-efficient, robust and durable, easy to maintain, and provide excellent NVH characteristics. Moreover, equipped with its common-rail fuel injection system the automotive variant meets Bharat Stage IV emissions levels while its off-highway counterpart, which uses a mechanical fuel system, will be capable of achieving the CPCB II emissions norms that are applicable from 2013. Building on a full range of engines delivered from the very successful collaboration with Ricardo, the new engine family now includes two, three, four and six-cylinder variants following the launch of the first two-cylinder model in 2010. 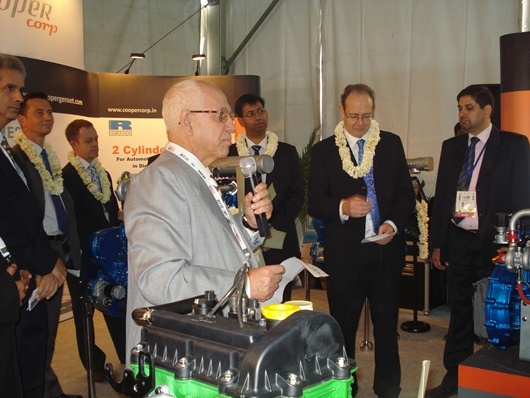 The new Cooper four and six-cylinder engines were inaugurated by James Bevan, British High Commissioner to India at the Auto Expo 2012 show.